Cisco QoS | CCIE or Null! A quick look at WRR. Weighted Round Robin our method of LAN QoS on the older switching platforms (2950’s/3550’s). Replaced by Shaped (or Shared) Round Robin on our newer platforms but WRR is still a big player out there so let’s take a quick look at it. Before we take a look at any configurations lets quickly take a look at how WRR functions from an overview perspective. So if we start from top to bottom the first thing we notice is the fact we have 4 queues to work with. Remember these are egress/outbound queues so we are working with outgoing traffic. The switch first checks the fourth queue to see if to see if there are packets in the queue and then it transmits its configured amount of packets. 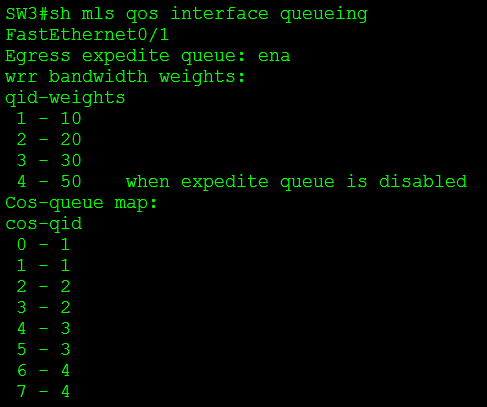 Once the configured amount of packets have been transmitted for that queue it moves along to the next queue. It works this way to ensure queues do not get starved and the switch is not constantly transmitting one queue all the time. After it gets done with queue one it will then reset and start back at queue 4. You don’t have to break it up so evenly you can put up 8 CoS markings in a single queue. After all QoS will be different for every network. 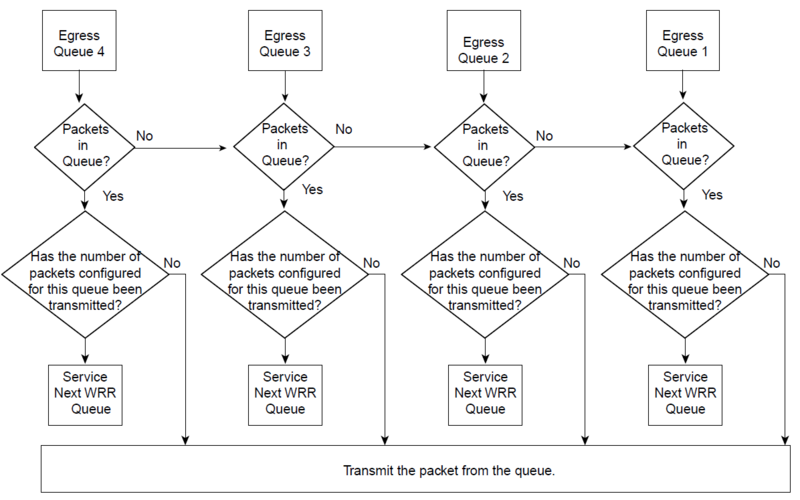 So now that we have our queue defined we need to define how many packets from each queue the switch will transmit before working on the next queue. This to, is also done from within interface configuration mode. You just have to be careful with what traffic is placed in the priority and how many packets are sent from that priority queue to avoid starving other queues or causing unnecessary latency for other traffic. This command will show you the QoS configuration on an interface by interface basis, I only included interface fa0/1 for this example. 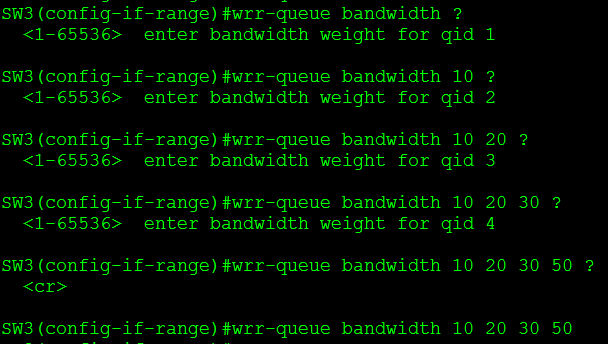 You see’ll that the expedite queue is enabled (queue 4) and the bandwidth per queue. Right after that we will see the CoS mapping to each of the queues. See the difference? Notice the priority keyword, that is what configures LLQ. Not too complicated right? Now what does this priority command really do for us, well it creates a low latency queue for traffic that needs to be transmitted before other type of data. So if there is data in the low latency queue when does the data in the other queue’s get transmitted, easy when the low latency queue is empty or when the low latency queue exceeds its specified amount of bandwidth. The low latency queue is also policed by the bandwidth we have allocated it. If the low latency queue ever exceeds the amount of bandwidth it has been allocated it will drop the packet and move to another queue. As I jumped into my QoS studies my first though was going to be “I’m in way over my here head this is not going to be fun”, after all QoS is a very daunting subject. However as I trek my way through the QoS Exam Guide I am finding QoS easier to swallow. A very large topic in the QoS exam guide is the MQC – Modular QoS CLI (Yes, an acronym within an acronym) this MQC is the way to configure QoS and boy is it simple to get the hang of. In fact the configuration of a Zone Based Firewall was actually based off the MQC design. That was a big relief to me, I’ve spent plenty of time around firewalls and to find out that the QoS MQC is really the heart of the zone based firewall configuration I was relieved, and even more relieved when I saw the configuration and understood it fairly quickly. Let’s take a quick run through the configuration of Class Based Weighted Fair Queuing (CBWFQ) using the MQC. Below is a list of other match statements, as you can see the list is quite extensive. You can match on everything from a specific interface to a frame-relay DLCI. Also notice the not statement, which allows you to exclude variables from the class map a nifty trick that can come in handy from time to time. 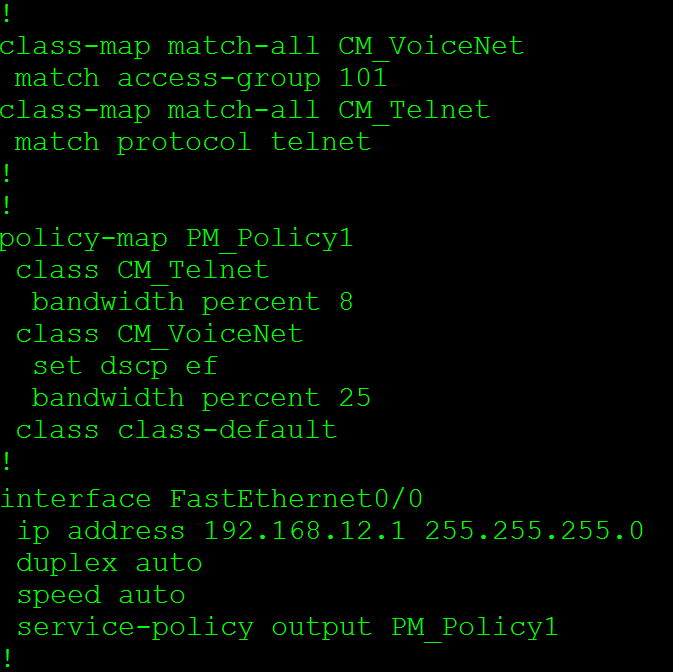 Now, the policy map is where you add the class maps (remember the class map is case sensitive) and have the router do something you want with traffic matched for a particular class map, whether it be re-classify the packet with a different QoS marking, reserve a specific amount of bandwidth for this traffic, or something else entirely (policy maps are quite powerful. I highly recommend you lab with them to see all the cool things you can do with them). Do keep in mind, until the policy map is assigned to a service policy on an interface the router will not actually do anything. We have one more step. 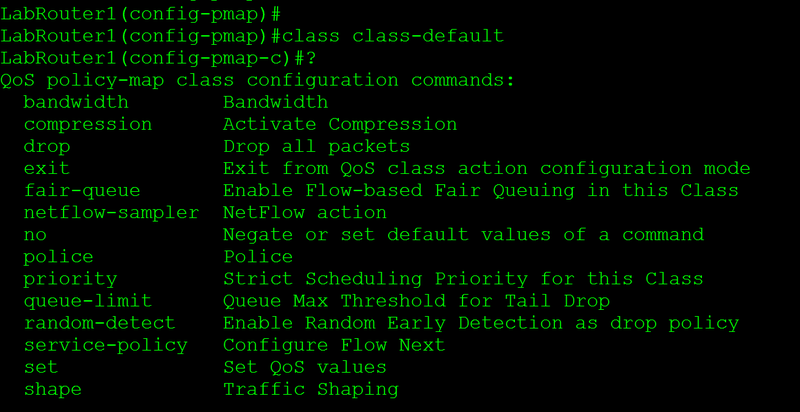 Here we have a list of actions that can applied to the packets matched to the class map we can do everything from compress the header, set QoS values, drop the packets, police or shape the traffic, and much more. So, there is a typical QoS configuration using Cisco’s MQC setup, this QoS method is also the configuration for CBWFQ, so hey I technically showed you 2 things with one blog post! Now the biggest different between the configuration of CBWFQ and the Zone Based Firewall is the service policy is applied to an interface and not a zone pair. 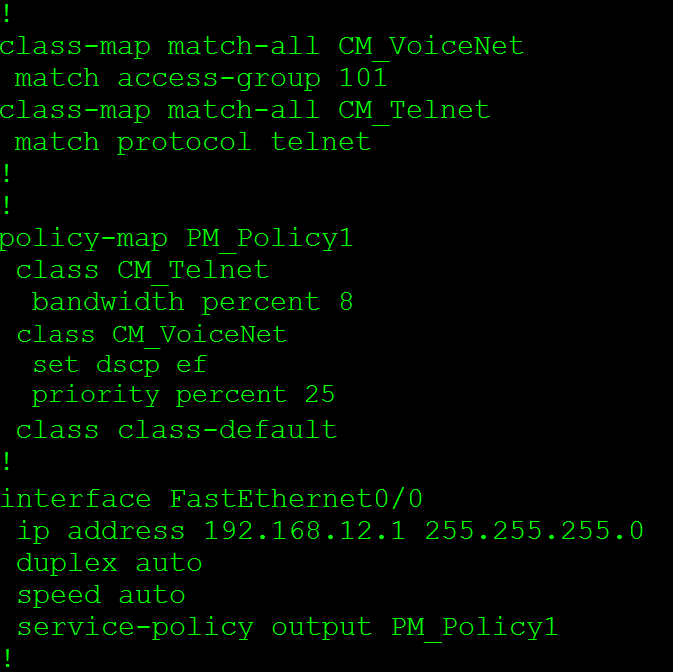 Notice there is a class-default in there, the class-default is the where every packet gets matched that does not match any other class map in the policy map, so you can easily effect all the traffic without matching every protocol or subnet, again something that can come in handy from time to time.